If you love warmth and sunshine, this is the perfect US road trip for you. You'll get to see eight different states. 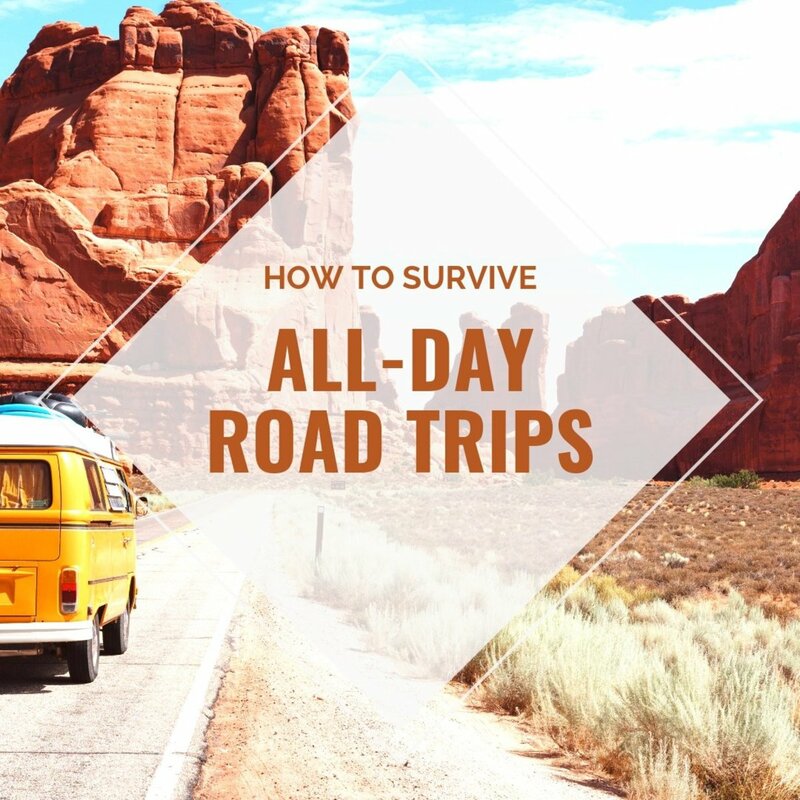 If you drive at a leisurely but efficient pace, you can make this trip in nine days. Along this route, you will begin in Los Angeles and end in Jacksonville, Florida, passing through the states of California, Arizona, New Mexico, Texas, Louisiana, Alabama, Mississippi, and Florida. So many more beautiful places! Interstate 10 runs from coast to coast, covering a total of 3,960 miles. What lies off the exit ramps? Side destinations off I-10 will make or break your trip. Think of I-10 merely as a roadway that you get back on between the really cool stuff, like the national parks and the coastal Florida panhandle. As you travel through this guide, take note of the special side trips that aren't too far off the main route. Beginning your I-10 road trip in the west puts you right in the heart of Los Angeles. There aren't many areas of the world where you'll encounter such a diverse culture as Los Angeles (okay, maybe New York). The best of everything can be found right in the city limits of LA, from restaurants to zoos, skyscrapers to mountains, busy roadways to tranquil parks. If you have time to explore, head to the northern side of LA and visit some of the famous beach communities: Venice Beach, Santa Monica, and Malibu. Along the southern side are Long Beach, Newport Beach, and Huntington Beach. Heading southeast, you will feel the temperature rising. The towns of Palm Desert, Palm Springs, Indio, Indian Wells, Rancho Mirage, and Cathedral City comprise the hot desert region of Coachella Valley. It's known for its spectacular golf courses and mountainside homes, but also has some of the best restaurants, nightlife, and relaxation opportunities you can find in the entire state. This is definitely a place you'll want to stay a night, especially after being out on the open road all day. 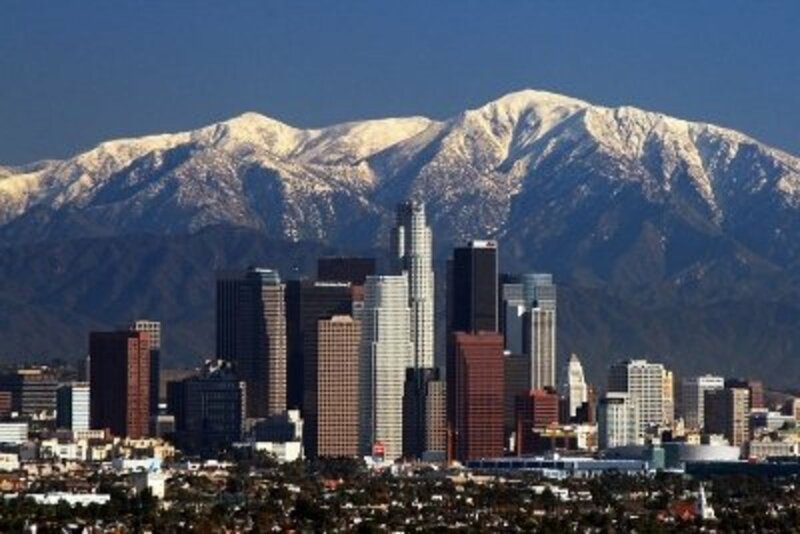 What's cool: A unique culture all its own, LA is made of many smaller cities that each have their own personality. Beach towns like Huntington Beach and Long Beach differ greatly from the inland parts like Hollywood, Beverly Hills, or nearby Anaheim. It's just over 120 miles to San Diego from Los Angeles, an easy drive south along I-5. This drive will take approximately 2-3 hours. On the northern side of San Diego is "Old Town." Also on the northern side is the beautiful shorefront community, La Jolla. Further south, you'll find Sea World and the best zoo in the United States: the San Diego Zoo. To the west of San Diego lies Coronado Beach, connected via the San Diego-Coronado Bay Bridge. Don't let the dry climate and openness of Arizona fool you. There's plenty here to see. Along I-10, you'll pass through Phoenix, where temperatures regularly pass 100 on summer days. Be prepared if you are traveling in the warm months! North of Phoenix, right in the middle of Red Rock Country, lies Sedona. Red rock formations tower into the air, surrounding the upscale desert community. Sedona is home to a large, impressive art community, as well as some of the state's well known spas and state parks. Have you ever traveled along I-10 from end to end? No, never done it but it sounds fun! I've traveled part of it, but never the whole expanse. I have traveled the entire interstate! Nah, I'm more of a flyer than car person. 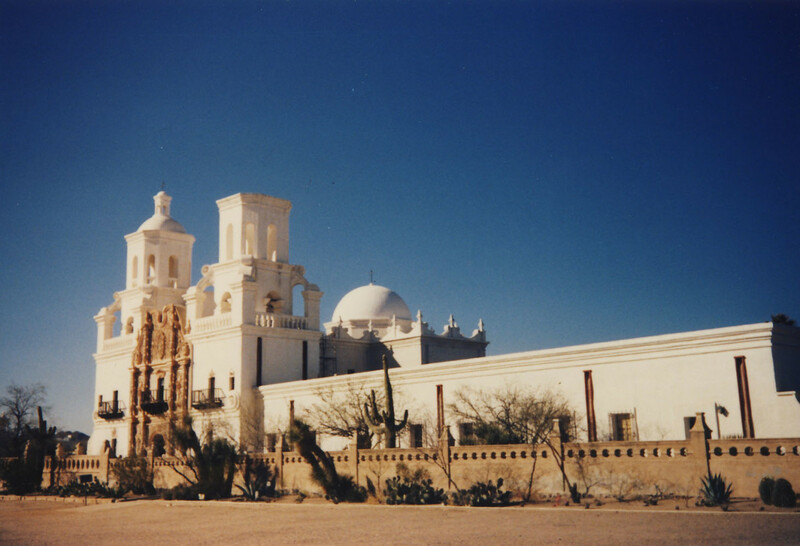 The oldest mission in the Southwest is the spectacular San Xavier del Bac Mission, ten miles south of Tucson on Interstate 10. Adobe brick towers into the open desert sky in this Spanish architectural gem. Amazing patios, domes, altars, chapels, towers, painted ceilings, stonework, and native cacti make this a fun trip. Only a small portion of New Mexico is on Interstate 10. However, to the north are several natural wonders like White Sands National Monument and Carlsbad Caverns (see below). The Latino and Native American influence in Albuquerque is colorful and vibrant, with a cool style all its own. Your drive through the rest of New Mexico can be a dramatic ride or a boring one, depending on your outlook. The scenery is much the same throughout the hundreds of miles of highway, and there are no major cities until you reach Tucson. Instead of looking at the dry desert environment as bleak, lifeless, and dead, instead, see the desert for what it really is: A complex environment teeming with life. During the day, the white sands can be blinding, but as afternoon approaches, the setting sun brings brilliant colors that light up the landscape in pinks, oranges, purples, and browns. The nocturnal desert wildlife comes out to hunt or be hunted, and the stars illuminate the roadway. If you're looking for a true clear nighttime sky, New Mexico is where you'll find it. Those used to the light pollution of populated areas will be amazed at how the sky is truly supposed to look at night. Note: Before heading into western Texas, fill your gas tank. Western Texas is miles of open highway with few opportunities to fuel up. When you see a chance, take it. What's cool: Santa Fe defines the southwest. The city offers a unique desert experience, with a great art community, Spanish-style architecture, top-notch dining, and excellent hiking. 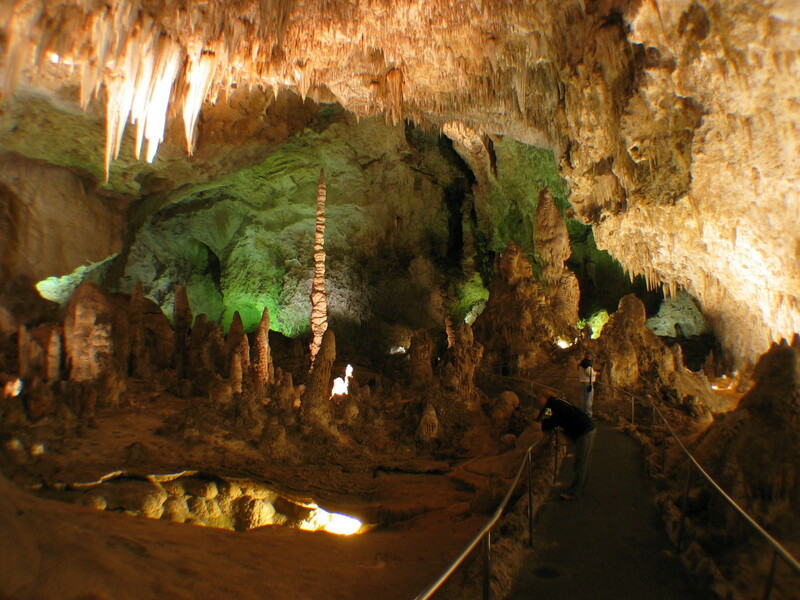 Take a trip to New Mexico's amazing, partially underground, national park, Carlsbad Caverns. You won't regret it. 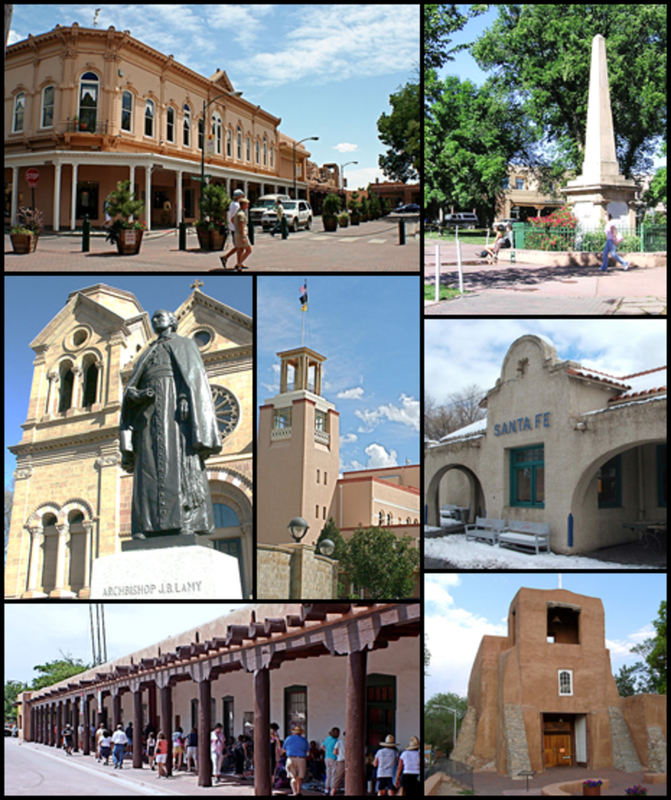 Carlsbad is a small town in the middle of New Mexico, near the Guadalupe Mountain Range and the northern Chihuahuan Desert. Inside the massive cavern are stalactites and stalagmites, natural limestone formations that formed over thousands of years. Bring a sweatshirt, the average cave temperature is around 55 degrees F! This area of the country offers so much natural beauty that the only way to see it all is to make a giant circle. The area is called the Grand Circle, and it lies far off the Interstate. It's really a separate vacation in itself. 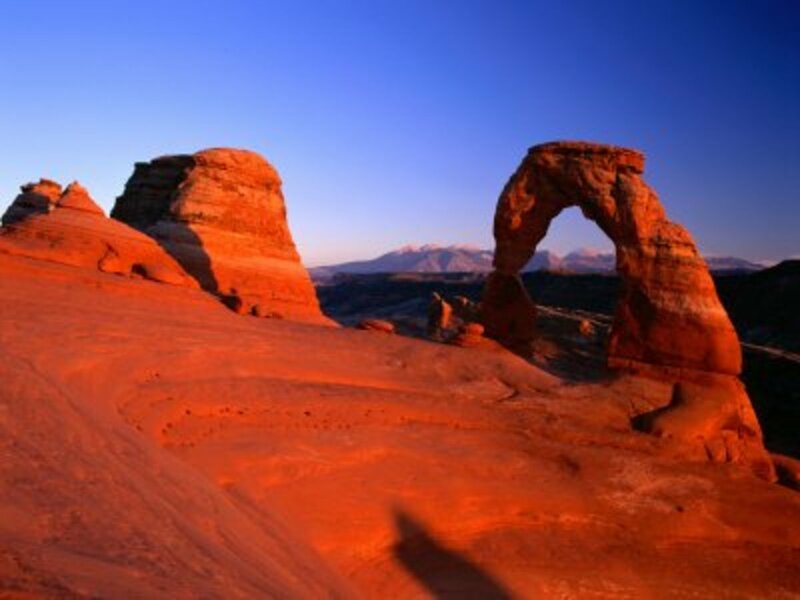 In about 7-10 days you can see numerous national parks, all of them breathtaking. You may want to plan a separate trip for these parks, but if you have time, the nearest park to Interstate 10 is Petrified Forest National Park, about 260 miles from Phoenix. Petrified Forest National Park A forest of petrified wood and colorful "badlands," the clay-rich landscape of the southwest. Bryce National Park A large amphitheater of rock formations called hoodoos in southern Utah. Capital Reef National Park A large formation nearly 100 miles long called Waterpocket Fold, a plateau in the middle of the southern Utah desert. Canyonlands Spectacular canyon views, biking, hiking, and enormous panoramic vistas of the southwest from high elevations. Zion National Park The challenging terrain of the Narrows section of Zion and the beautiful enclosed canyon are must-see destinations. Mesa Verde National Park A long lost culture of Native Americans can be found again in the ruins of Cliff Palace and Mesa Verde. Monument Valley You may not have been to the Navajo area of Monument Valley, but you've definitely seen it in western movies and television commercials. Arches National Park An incredible view of the majestic and strange arches that millions of years of erosion have left behind. Black Canyon of the Gunnison The Gunnison River carved a mighty slice in the earth in Colorado. Great Basin An underground cave is nicely complemented by gigantic Mount Wheeler in this eastern Nevada park. The Alamo in historic San Antonio. Everything is bigger in Texas, including the long stretch of roadway between El Paso and Houston—nearly 900 miles. That's comparable to driving the distance from Providence, Rhode Island to Charleston, South Carolina! 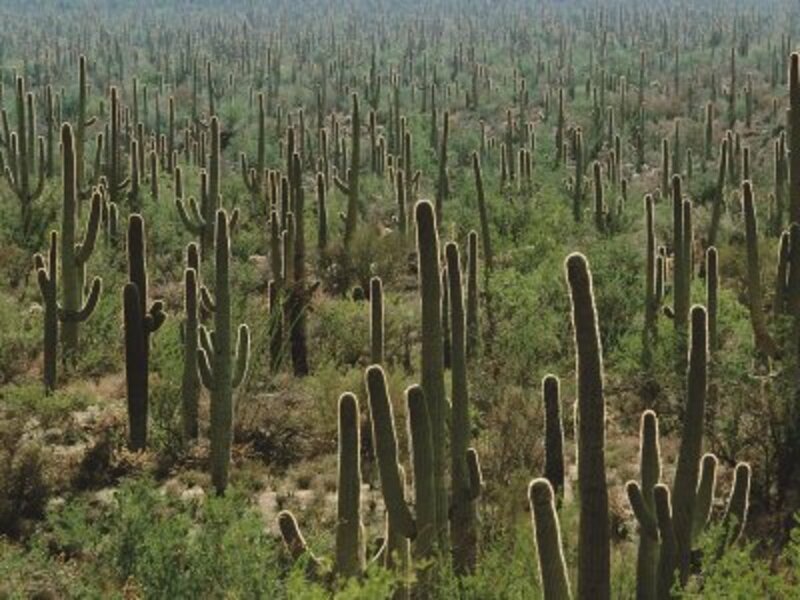 Upon entering the mountainous El Paso area, look for stellar views of the Chihuahuan Desert. In between San Antonio and El Paso, you won't find much. However, there are some sights to see off the Interstate if you have the time. Big Bend National Park is on the southwestern portion of the state, along the Rio Grande River. To the north, you'll find the beautiful Guadalupe Mountains National Park, which contains the highest peak in Texas. San Antonio is the unofficial divider between the eastern and western parts of the state (see below.) On the eastern side of the state, the air becomes gradually more humid as you approach the Gulf area of Houston, America's fourth largest city. Where should you stay in Texas? From personal experience, you'll want to stay in the major cities. Plan your day to end in Las Cruces, New Mexico, San Antonio, or Houston. What's cool: Don't miss Austin's music scene. For more of an amusement park experience, visit Sea World in Dallas. Aviation buffs will enjoy Houston's Space Center. At the midway point between Florida and California (and in the middle of Texas) lies the second largest city in the state, San Antonio. 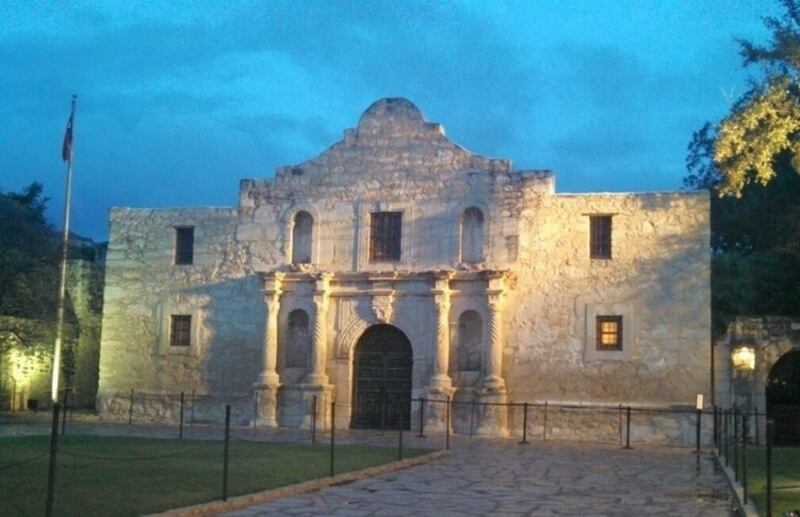 The historic section of town is home to the Alamo, the site of a 13-day siege between Mexican and U.S. forces. The oak-lined River Walk is beautiful place to visit. Follow the San Antonio River as it winds underneath the city, with towering palm trees and oak trees lining the paved banks. 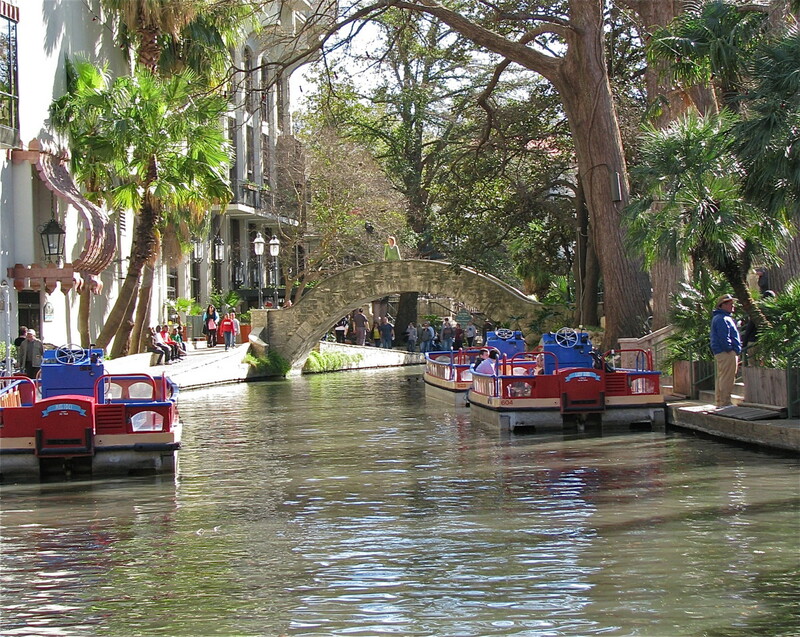 Complete with pedestrian walking, fine restaurants,and lively bars, the River Walk is one of the must-sees of San Antonio. If you're looking for fun in the form of amusement parks, San Antonio also has its own Sea World, as well as Six Flags Fiesta Texas. San Antonio Missions National Historical Park preserves some of the city's 17th century Spanish missions, while the nearby San Antonio Botanical Garden displays beautiful plants and gardens. Louisiana is a crossroads of cultures. You can see it in the varying built-up cities to the sprawling plantations and swamps. It's one of the warmest states in the country, and the humidity makes it feel even hotter. Louisiana is about as "Deep South" as you can get! 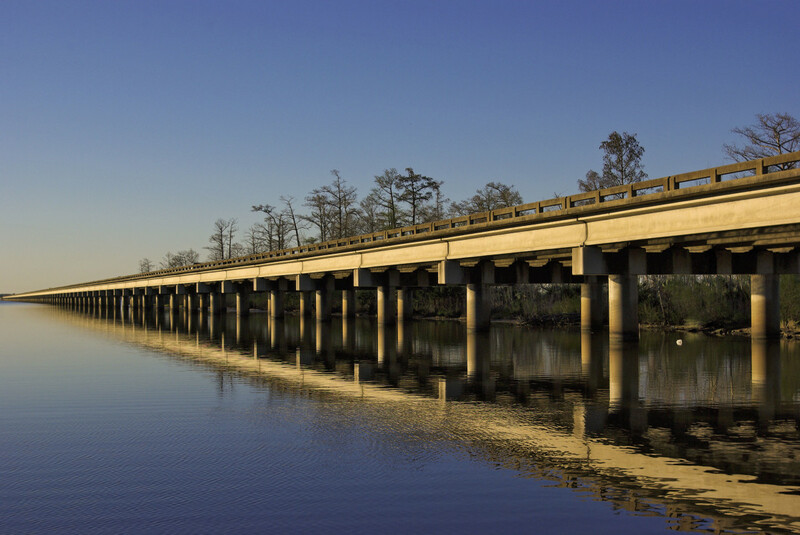 Interstate 10 stays mostly inland, but does pass through Lafayette and Lake Charles—two towns that are the center of Cajun culture. Stop in for some authentic Cajun food, at Nimbeaux's, Julien's, and the Blue Dog Cafe. The coast of Louisiana is immense and vital to the entire country. The longest river in the United States empties into the Gulf of Mexico right in Louisiana's Mississippi River delta, which is the lifeblood of the entire state. Tributaries fuel the bayous, ponds, and lagoons and wind their way to the Mississippi itself. It all culminates south of New Orleans, one of the most vital ecosystems and migratory bird stops in the country. Paddleboat tours give a great glimpse into the importance of the river delta. By car, you can tour much of the delta (or at least see it close up) by driving Highway 21 south to Venice. This is as close the Delta National Wildlife Refuge as you can get. If you'd like to see it further, you'll have to take a boat. 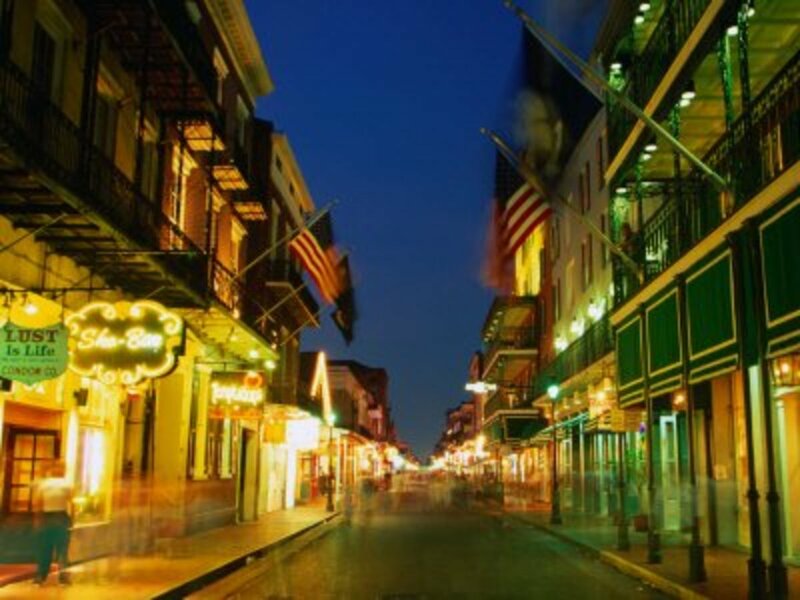 What's cool: The home of Cajun culture, Louisiana blends many influences from around the globe. There's Native American influence, old French ancestry, and Creole and Southern charm. Visit the Garden District, enjoy the trees, and stop by a restaurant for some authentic Cajun cuisine. It's hard to talk about the Mississippi coast without talking about Hurricane Katrina. The coast is still rebuilding. The areas of Gulport and Biloxi offer casinos and restaurants with excellent views of the Gulf Coast's amazing beaches. What's cool: Try taking a river tour, or explore the roads along the Mississippi. It takes about 90 days for Mississippi River water to move more than 2,500 miles from its source at Lake Itasca, Minnesota all the way to the Gulf of Mexico! Alabama's coastline has many lovely inlets and bays, enlarging the overall distance of shoreline. Lighthouses dot the bays leading to Mobile, making for a scenic drive. The city of Mobile lies at the head of Mobile Bay, which separates Alabama from Florida. 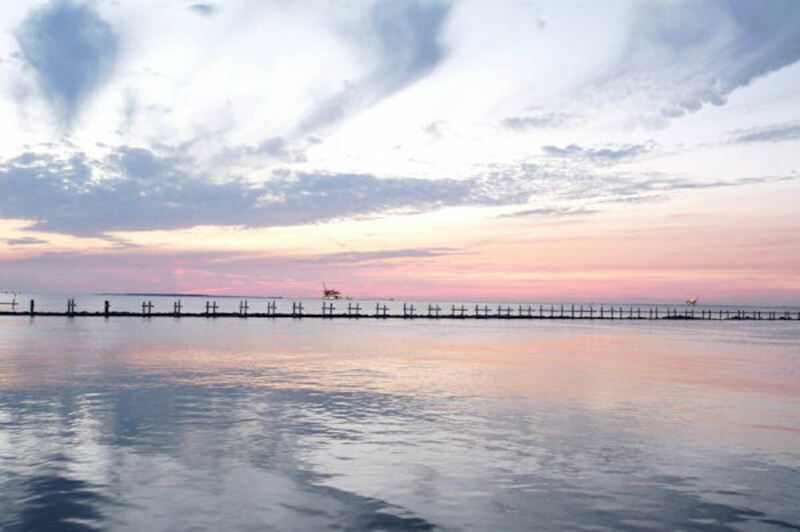 In the center of the bay, you'll find the spectacular Dauphin Island. In Mobile proper, find the Museum of Mobile and the USS Battleship Alabama Memorial Park. This is where Mardi Gras celebrations take place every year. 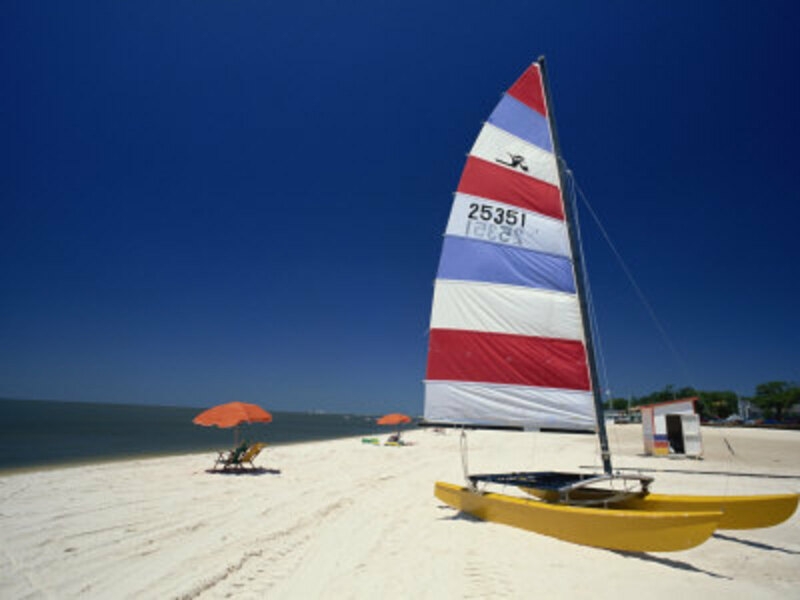 Mobile's real attraction is the Bay and surrounding beaches. Delta excursions through the massive river delta, over twenty golf courses, and some of the south's best seafood restaurants, are all within the Mobile Bay area. Florida has hundreds of destinations on the coast as well as inland Orlando, but some of the best beaches lie on the panhandle. 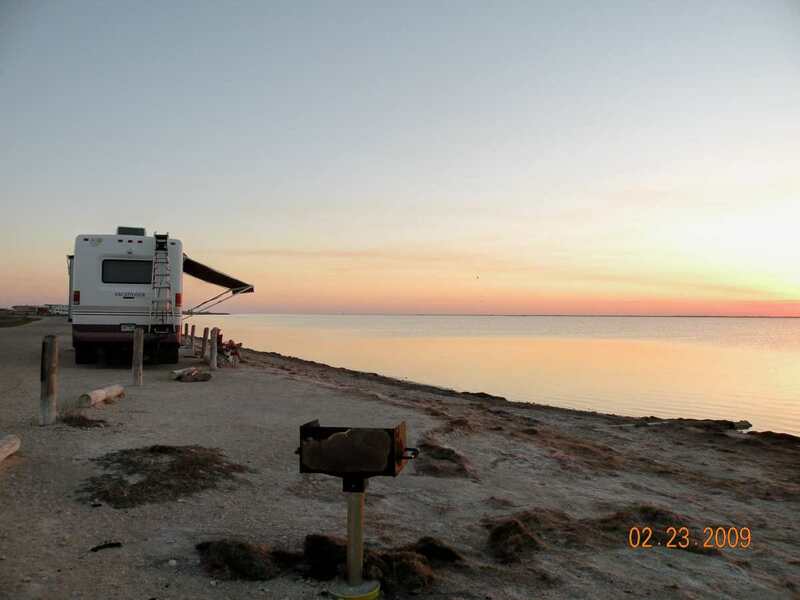 Smaller crowds, pure white sands, and southern flavor make the Florida panhandle a delight. 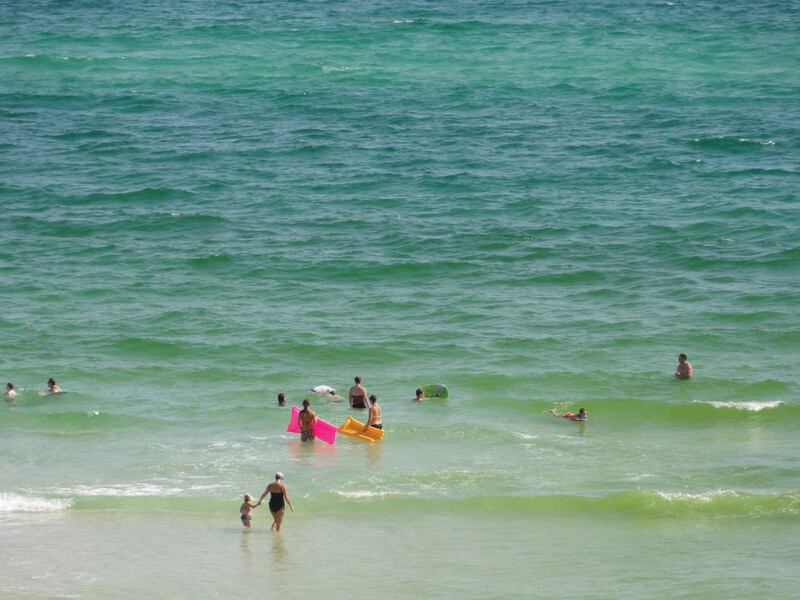 If you have the time, the Emerald Coast has some beautiful beaches worth visiting. 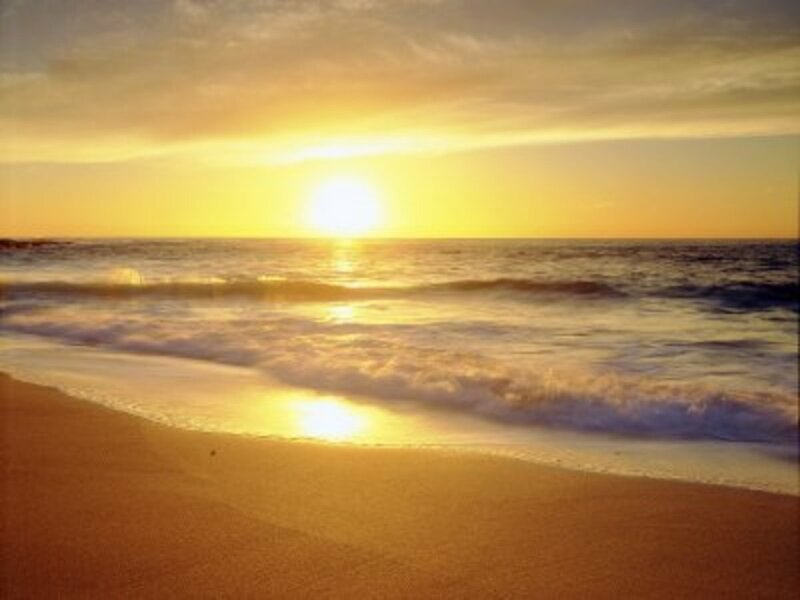 Port St. Joe, Panama City Beach, Gulf Breeze, and Pensacola have some of the top-rated beaches in the USA. Interstate 10 ends (or begins, depending upon your point of view!) in the city of Jacksonville. There are plenty of things to do and see here. What's cool: Try visiting one of the many coastal panhandle towns like Pensacola, Tallahassee, or Panama City, for some of the best beaches for miles. Georgia and South Carolina have some of the most spectacular coastline in the country. The Cumberland Island National Seashore is in Georgia, just a few miles north of the Florida border. Also in Georgia is the unspoiled Tybee Island and historic Savannah. In South Carolina, visit Hilton Head Island. Head into historic Charleston. 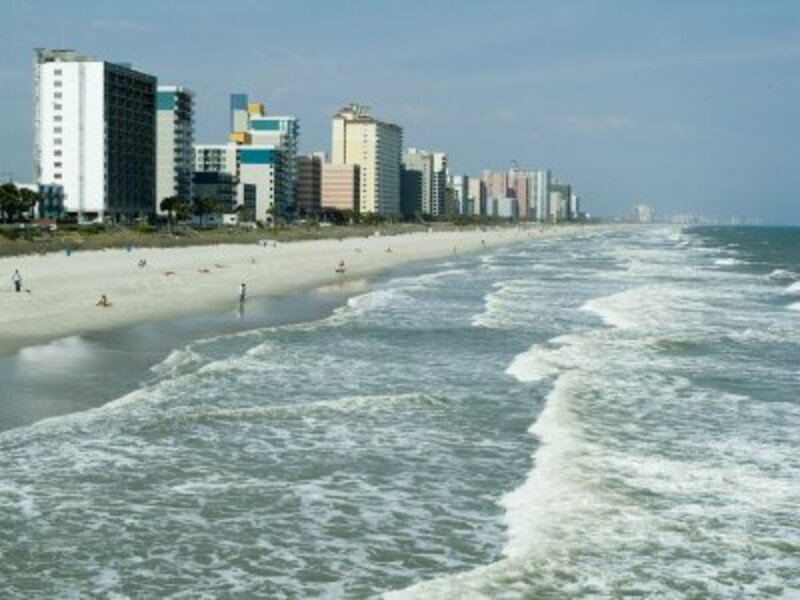 Further north, the beachside town of Myrtle Beach is a favorite for those looking to for a fun and relaxing atmosphere. Which state on I-10 would you like to visit the most? What's Your Favorite Site Along I-10? I am not to fond of heights I.e. bridges and mountains without guardrails. How much will I have to endure on I 10 from Fl to California? I’m planning this trip backwards from NJ then up the coast road to Oregon , and then back to NJ solo on my Motorcycle .. summer 18 .. Ill be 65 and retired .. living the dream.. Your tour looks amazing. Thank your for sharing it! It's my dream to visit United States....Great Lens!! @Lensmaster...When I was younger, I took many a driving trip, but mostly in the Great Lakes and Eastern area of the U.S., closer to where I've lived. This was a beautiful trip in the West! Thank you for sharing it! Congratulations on the Lens' Purple Star award! @jmchaconne: Wow! This is a lens I have to see. @eightieschild: Thanks for the inclusion! Hope you get to see it via road trip at some point, there's a lot to see. @BarbRad: We went in late spring - early summer. It was warm, but if you're from New England you'll welcome the heat after six months of blizzards. Someday I'd like to take this trip after the snow melts and before the summer heat sets in -- or maybe in autumn. Cool lens, this road trip looks fantastic. I've actually traveled the entire length but not on any one trip. When I was a kid we took the lower southern route from Texas to the East Coast and then up to Philadelphia and several times I drove the western route to Arizona and California. 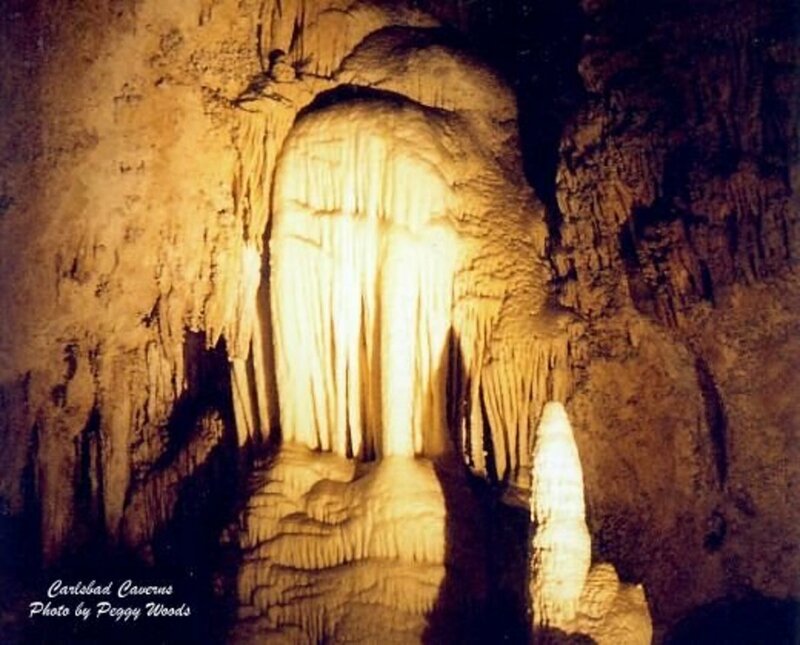 I remember Carlsbad Caverns as a kid and how they turned the lights out and scared the bejeebers out of me. I must have been about 4. I can wait to take a trip like this. Except i would be coming from Gettysburg PA. Cool Lens! @Cynthia Haltom: I'd love to get back to Mississippi someday soon. Hurricane Katrina may have taken away things, but the spirit of the people here in Mississippi should be your main attraction. 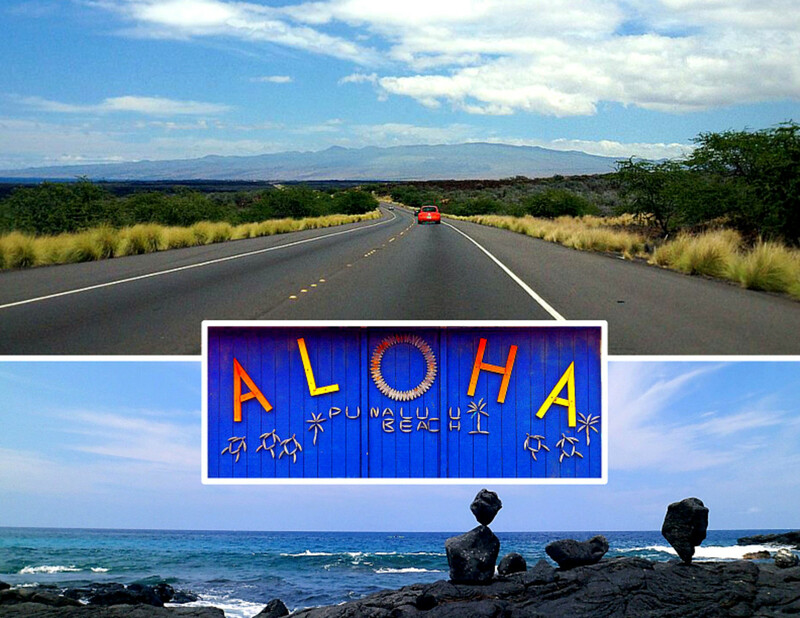 We have over 20 miles of white sand beach, NASA, and a varied culture from city to city. Come visit. I've visted the USA three times, but have never yet done a road trip. It's one of my dream holidays though, and hope to one day visit some of these amazing sites. I have always wanted to go to Santa Barbara. Perhaps one day! I grew up near I-10 in south Mississippi, and now live in New Orleans. So I've traveled a lot of I-10, going to Florida and Texas and elsewhere, but I've never driven past San Antonio or so going west, and haven't been all the way to the far eastern part of Florida on it either! Stop at almost any seafood restaurant in east texas and louisiana along 1-10 and try some boiled crawfish! A staple of the creole diet in the spring! Can't wait until we buy our RV so we can get out on the wide open road. I love to travel and would love to see so many things. Great lens. I have to agree with others. After reading this lens, I'm feeling like it's time for a road trip. Thanks for sharing. Spectacular photos and a great lens. Actually just drove a portion of this highway (I10) from Phoenix to Tucson. A great side trip was taking "8" to Yuma, then crossing over to Los Algadones in Mexico - 4 blocks and 400 dentists, plus as many drug stores &amp; optical shops. I've never seen so many US retirees sporting such good teeth &amp; snazzy new glasses! wow! There are so many beautiful pictures. Wish I could make it to this road trip one of these days! Super nice lens! I love the photos and all. Great job! I look forward to the grand canyon someday, these is amazing place. Thank you for your amazing lens, very helpful! I had to come back and visit you again - I absolutely love this lens. I've traveled much of the southwestern route from Texas to California and would someday like to try the whole length of I-10. @Countryluthier: Thanks for the blessing! This lens made me want to jump in the COUNTRYLUTHIER mobile and hit the road right now. Blessed! 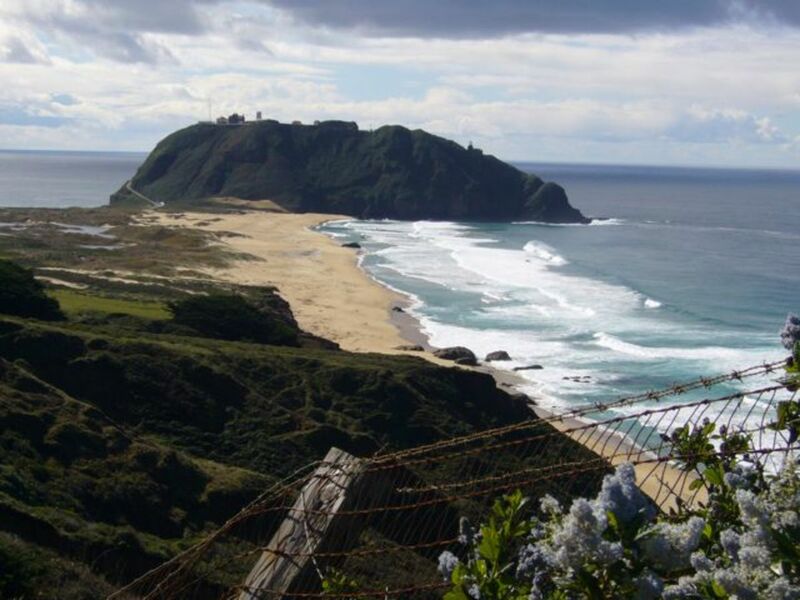 @Glenda Motsavage: It's a great trip. There's so much to see within the vicinity of I-10, I can't wait to plan another trip myself. It was 7 years ago for me. @VspaBotanicals: Let us know how the trip goes! Have fun. My son just moved to Texas to start his intern job. I've always had a plan to start from Louisiana and work my way through to the desert. This lens just helped with those plans I want to do in the future. Wonderful lens! Think I'd like to do the entire I-10 trip in 2013 for our 26th Anniversary! Thanks for a great lens...well deserving of the Purple Star! @dismantlerepair: Wow, I'm glad this lens helped plan your trip! The southwest is incredible, I can't wait to get back there someday. Of all parts of the USA, the Southwest left the biggest impact on me. Off to visit your lens.. I remember stumbling upon this lens ages ago when I was just starting out on Squidoo and it stuck with me as I was in the midst of planning a trip of my own based on some of the things you mentioned. Well last Oct it all finally came to fruition (rather quickly!) and it was ace! By far the best holiday/trip I've ever been on, and I got to do it on the back of a motorbike! The Grand Canyon was mind-blowing as was the vastness of some of the deserts! Anyway I am just in the process of writing it all up (it may or may not interest you: http://www.squidoo.com/motorbiking-around-south-we... and I decided to revisit your lens I discovered all that time ago. It brings back such good memories of the trip, and this is all just a round-about-way of saying Great Lens!! I'm sure it won't be the last time I visit it as it evokes such great memories! I love your US road trip lenses - they bring back great memories, and give great ideas for more places to see and visit, thanks! Los Angeles! Beautiful places and cool pictures! Very detailed and interesting lens. All pictures are beautiful. Was lucky enough to live in the USA and one of our final holidays was a coast-to-coast round trip from Virginia, going outbound north to New York state, then west to NE, then down the west coast, heading back east from LA. From there, we wanted to concentrate on Route-66, so the I-10 didn't really come into our itinerary. It was a trip of a lifetime and too many highlights to mention! Hope to head that way again in the future, so will keep in mind if our journey takes us in that direction. I've traveled several sections of this, but we now travel in a motor home and I would like to do the whole trip in it. I don't know much about road trips but what you've done is certainly a long one and inspiring. great lens! Fabulous lens. I will be in Arizona next week and plan to take this journey after Christmas. You present it beautifully. *Squid Angel Blessed* and added to "My Squid Angel Blessings for 2012" in the "Travel &amp; Places Â» United States Â»" neighborhood. I've traveled along some of I-10. The parts of Utah, Arizona, and New Mexico were spectacular! i wish i had the time to take this trip! Grand Canyon and Hoover dam were quite impressive. Also meeting native Americans along the way. What a great guide, I've been looking into sorting a trip for America and this has kicked started me! Wow this looks really pretty! I'm begging my parents to take me on a cross-country trip! I have not traveled this route, haven't done much traveling at all, but just the other day a friend and I were talking about doing a year long cross country tour. I think this route, however from east to west, would be fun to try. In 1998, I rode a bicycle across America, from Santa Barbara CA to Boston, taking a southern route to Dallas; then back up trough Oklahoma, Missouri, Indiana, Ohio, Amish country, Virginia, Washington, Maryland, PA, upper State N,Y, and Boston. The Southern part of the route, especially through Arizona, and New Mexico, was one of the most beautiful, and exotic part of the ride. You have inspired me to do a lens about it! Thanks for a great lens! I haven't traveled it, but it looks like a really awesome trip! Florida State University is a great place to stop off on i10 if you are looking for a good party! Coming from Colorado we miss being close to the ocean. My favorite part was seeing the Gulf of Mexico for many, many miles. The Thing near Dragoon, AZ! 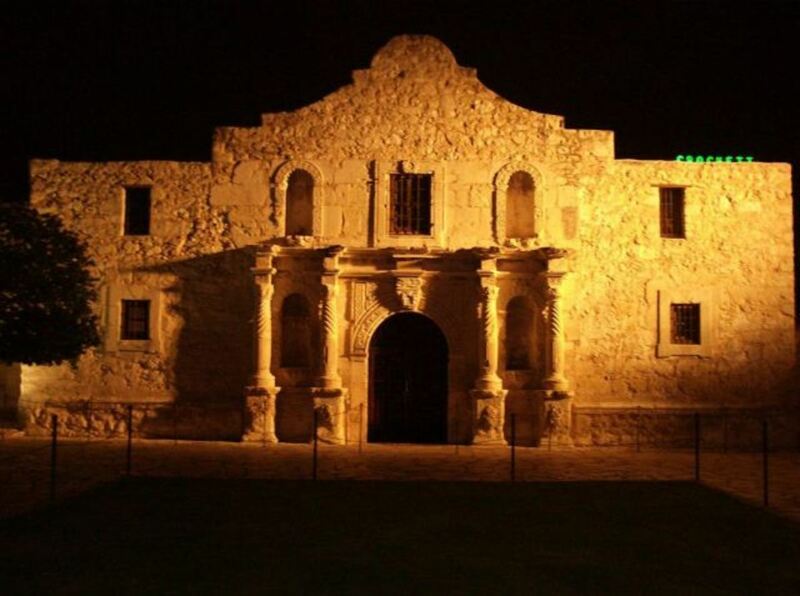 Being a native Texan, it would have to be the Alamo. For those that haven't seen it, you might be surrised that it is located in the middle of the city. Amazing road trip! It's the only one I have yet to travel. I will soon! Great info and pics here, thanks for sharing! We've enjoyed many of the States and attractions you've mentioned here and return often in our RV from Canada. We especially enjoy the coastal route from Texas to Florida! This lens brings back a lot of great memories. Need to hit the road again someday soon. My favorite site is Corona Del Mar (beach) next door to Newport Beach California. Gorgeous! I would love to plan a road trip! I flew to the east coast from LAX quite a bit. One of these days, I'll drive across. I'm in Austin and my kids are in San Diego...I've made that trip several times but not the whole route! I would love to do that! Great lens! I find I-10 to be the modern day equivalent to Route 66. It's packed with interesting sites that make a road trip well worth the time. Wow I feel as if I just took a road trip ! Too too many to name!!! I lived in Arizona for a few years and miss seeing the area. 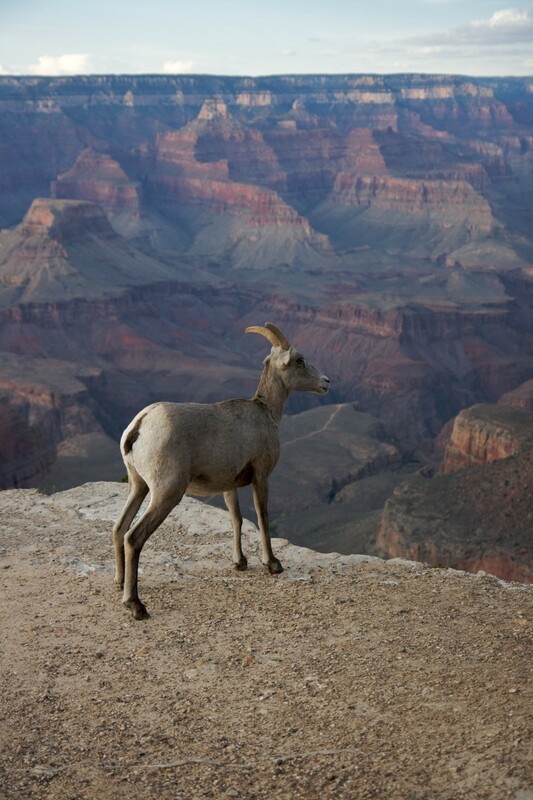 All the pictures are fantastic, but nothing like standing at the rim of the Grand Canyon! I do miss US I10! There is lots of fun hiking in "red-rock" areas in Sedona AZ. The travel of my dreams! Awesome. I've always liked driving through Arizona. I would love to go to a roadtrip too. I have a picture from my Georgia, Savannah trip that looks almost like your main Louisiana picture. Savannah's historical district is beautifully dotted with amazing buildings. Great lens! 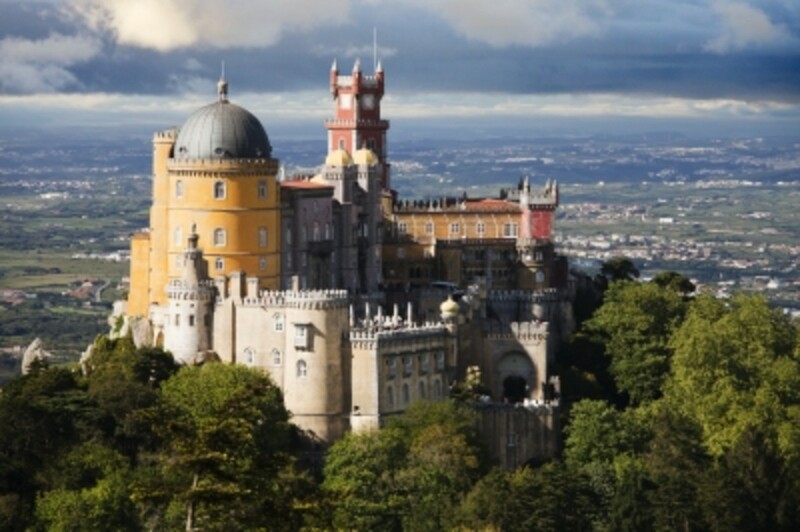 I'd love to see some of these sites and landmarks in person. I really want to visit the US now, thanks! I live in Northern CA. I've never driven to South CA, but I would love to. What I would give to be able to do a road trip like this-I can dream or read lens like this. Here what I'm looking for, whenever i'll plan for US trip, will go through this lens. bookmark it in my favorites. Thank you so much. Another great lens. I didn't have a chance to travel this route before. I love the idea Going the Road Less Traveled. It is full of adventure. Good or bad, you have stories to tell after this adventure. Well done! The travel through Arizona and New Mexico is beautiful! Myrtle Beach is the PLACE to BE!